Use this reclaimed wood cocktail table to store a multitude of items. Featuring natural tones, this table has a rustic appearance to create a warming aura reminiscent of a log cabin, and the metal legs complement the rural design while increasing durability. 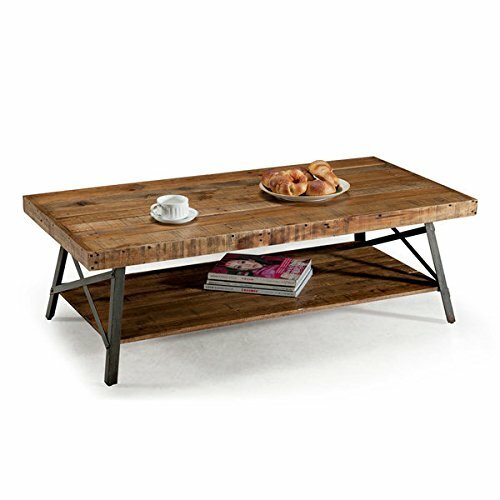 Place this cocktail table in front of your couch to provide room to store food and drinks while reading a thrilling book or enjoying a captivating movie. With an 18-inch-height, this rectangular table is the ideal height for grabbing items while lounging on your sofa, and the bottom shelf provides additional storage space for decorative items or reading materials.